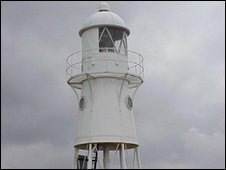 A Somerset lighthouse is to be switched off following a national consultation. Trinity House, which operates Blacknore Point Lighthouse in Portishead, said it would close by 2015. The lighthouse has been guiding vessels since it was built in 1894, but the use of modern satellite navigation systems means it is no longer needed. A second lighthouse in Suffolk is also set to close. A decision on what to do with the buildings has not yet been made. A Trinity House spokesman said: "The decision to discontinue Blacknore lighthouse has been taken following traffic analysis of commercial and leisure shipping in the area. "Decisions have been taken primarily on the navigational requirement." Orford Ness lighthouse in Suffolk will also be switched off following the consultation. Two other lighthouses in England which had been earmarked for closure will remain open. The lights at Beachy Head in Sussex and Hartland Point in north Devon will continue to shine, but their ranges will be reduced and their fog horns will be switched off. Maryport lighthouse in Cumbria, which was also under consultation, will be handed over to the local harbour authority to run. In total, six lighthouses around the UK will be switched off under the plans.